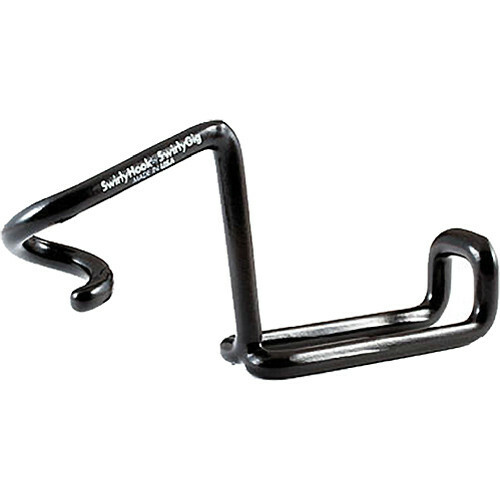 The SwirlyHook Headphone Hook from SwirlyGig fits on any 1/2" tubing such as mic stands, shelving, or drum hardware and allows you to hang your headphones, cables, tambourine, or other miscellaneous items. It is constructed of steel coated with black PVC for grip and protection. Box Dimensions (LxWxH) 5.6 x 4.7 x 0.2"
SwirlyHook Headphone Hook is rated 4.5 out of 5 by 2. Rated 5 out of 5 by Detati Communications from Simple device to hang your headphones We use headphones for band rehearsal. I had some handmade wire hangers that I bent to hold the headphones but they were completely wrapped around the mic stand and not easy to remove. So I thought I'd see what was available commercially and discovered the SwirlyHook. Its exactly what we needed. Easy to attach or remove. Easy to move up and down on the stand. More than strong enough to hold any pair of headphones. Rated 4 out of 5 by jafmusicmix. from Installs quickly, saves my headphones Has no moving parts, simply slips onto any of my stands at any height and is easily removable/changeable on the fly. Gives my vocalist/instrumentalists in the studio a clear place to put the headphones between takes. They no longer have an excuse for tossing my expensive headphones on the ground.